After months of speculation, Apple finally unveiled their worst kept secret, the 7.9" iPad Mini. Apple will launch their answer to the Nexus 7 at a starting price of $329 for the 16GB WiFi model (our price estimate was pretty close, although 8GB storage assumption was off). Apple also announced a 4th generation iPad with an upgraded A6X processor, to replace the existing 3rd generation model. Let me start by talking about my first impressions from the launch. I was surprised that Apple decided to price the iPad Mini above the psychological $300 barrier. My guess is that Apple wanted its margins to stay above a certain level (my BOM estimate pegs the gross margin for the entry level at about 40%). 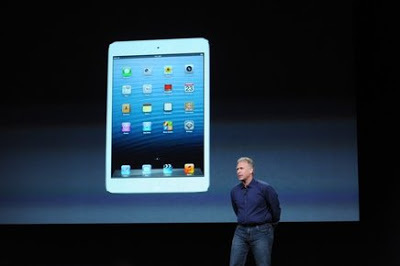 The biggest surprise was the launch of a 4th generation iPad just 6 months after the 3rd generation model. This seems like a very clear attempt to minimize cannibalization of iPad sales by the cheaper iPad Mini. While I still need more inputs for an accurate sales estimate, I'm currently working on a cannibalization estimate for the iPad Mini. Meanwhile, let's take a look at the impact of Apple's pricing decision on the iPad Mini's target segments. This could also help narrow down the segments that are more prone to cannibalization. First time tablet buyers make up the lion's share of the potential market for smaller tablets. This market can essentially be divided into two (slightly overlapping) segments, price sensitive buyers and brand conscious buyers. Globally, this is the largest potential market for a smaller tablet. This represents the single largest, long-term growth opportunity for the tablet industry. However, at a starting price of $329 for the 16GB version, the iPad Mini is unlikely to make much headway against the Kindle Fire ($199 for 16GB, $159 for 8GB) and the Nexus 7 ($199 for 8/16GB, $249 for 16/32GB). Given the price/storage options, even more value conscious buyers could be swayed away from the iPad Mini. Even with the iPhone, this has never been a strong market for Apple. On the other hand, Android smartphones have made considerable headway in this segment and Android tablets are likely to follow. The iPad Mini could still pick up a decent chunk of this segment in developed markets (especially the US) because of lower consumer awareness about competing products. In terms of the sales mix, this segment is unlikely to look beyond the entry level version. This is probably the second largest consumer segment out there after price sensitive tablet buyers. This segment is likely to include the education sector, which the iPad Mini is squarely targeted at. While the education sector holds great, long-term market potential for the iPad Mini, it is just a small portion of this segment. This segment has traditionally been Apple's bread and butter. The iPad is the strongest brand in the tablet market by far and any brand conscious buyer looking for a smaller tablet is likely to opt for the iPad Mini. These consumers are likely to have opted for the larger iPad (as they would most likely pick the bigger brand regardless of their form factor preference), in the absence of the iPad Mini. This creates a very real cannibalization threat for Apple, and undoubtedly spurred the early launch of the 4th generation iPad. Also, this segment is likely to be more concentrated in developed markets as opposed to emerging markets, which means long-term growth potential could be lower. The sales mix among this segment could be diversified, but is likely to trend towards lower storage options. These consumers already own a tablet (most likely an iPad or 10-inch device) and could look to augment this with a smaller, more portable device. These buyers are unlikely to opt for higher storage options, but could opt for 4G connectivity. These consumers are likely to be very early adopters and could look to replace an older tablet with an iPad Mini. Cannibalization here could be very high as well, but the impact could be muted as the customer base is likely to be relatively small. The sales mix could be diversified across storage and connectivity options. Conclusion - Apple's pricing strategy should ensure in the continued expansion of the tablet market, but is unlikely to affect the growth of competing products like the Nexus 7 and Kindle Fire. Good analysis. But I don't think other tablets are making much headway. I think that can be supported by fact 1) No one is publishing tablet sales, not one manufacturer, 2) estimates are that the Nexus, the second most popular tablet, has sold 1 million since June -- that's the iPad does in less than a week, 3) iPad 2 is still selling well, particularly in education sector. I think Apple wanted to give consumers another option with similar performance as iPad 2 for an even better value. I'm not sure I agree. Those nexus estimates by gene Munster are terrible. Nexus 7 revenue is credited to Asus, not google. Also, other income always has a wide margin for error, so you can't base a sales estimate on it, even for ones sold on the play store. 3 million is likely. That's pretty good given the limited global distribution. ok, I'd be interested in seeing more accurate sales numbers then. I think that's a good point. But I do think popularity of iPad 2 sales says a lot about extending the market to consumers that want an iPad but weren't willing (or couldn't) spend $500. Although Apple doesn't break out specific sales numbers for the 2, the ASP did decrease for the iPad once the 2 was reduced to $399. That's true, the iPad 2's been really popular and that's been the primary goal with the iPad mini. As I said, I'm looking into the cannibalization estimates. That should give us some information about the iPad 2 as well. When I look at the iPad Mini I can't help but think of a few things. Samsung created this segment, because Steve Jobs didn't see the potential, Apple is WAY late to the game, and anyone wanting a "tablet" and is consumer aware likely already owns an iPhone and/or iPad and that means they aren't likely buyers of the iPad mini. That leaves those who aren't brand-conscious (price sensitive) and they aren't going to be particularly interested either. What significant segment does that really leave to purchase the iPad Mini? I think Steve was right on when he said the 7" form factor would be DOA but as it goes, what Steve says, Steve makes reality ... for the Apple crowd. I think he caused Apple to miss the boat all together on the 7" form factor. This is even more true when you look at the screen specs for the "BIGGER" (quite the point was made about the 7'9" screen compared to the standard 7" screen everywhere else) but significantly lower quality screen of the iPad Mini. I'll be the first to admit that I'm biased toward Android when it comes to mobile O/S's but I've always been willing to admit that Apple is good at hardware quality and being first to market with product+hype. This time, they failed on both accounts AND have the inferior O/S (subjective? prove it) so they're left with nothing but margins from Apple loyalists. Add this to the Google Maps debacle and a pattern begins to emerge. Mark my words. Just like with the Mac, Apple had its day and again, they lost momentum but then again, few companies do as well as they do initially and nobody really ever keeps the momentum. No tablet other than iPad has sold well. iPad will dominate the tablet market forever. Very interesting points. This is where cannibalization could become dangerous for Apple. If you're sales are mainly from iPad owners replacing it with the iPad mini, that's pretty much the worst case scenario. Apple's bet is the trade off between new customer acquisitions and cannibalization. But at this price, that looks tough. @Michael Richardson: I would argue that the mini is actually the ideal form factor for tablets, people are underestimating how much more practical they are than the larger ipads. It is far easier for the customer to extract value from the device with the smaller form factor. As you say Samsung did create this space, however I believe a lot of potential customers have shied away as they prefer the variety and quality of the Apple ecosystem. There are many iphone owners who have made do with their iphones as the ipad was either too expensive or too large. The other point I would also like to make is what people have never really understood about why people buy apple products. Everyone goes on about the hardware and how it doesn't make sense that consumers are paying over the top prices for devices that are technically inferior. Analysts point to the brand and I don't think that is the answer. The answer is not the software either, many argue android is a superior OS. The answer for me is the ecosystem, here apple had the head start and by far it has proved to be the most important area to have had a head start. These devices are not just about consuming media, all of them can do that. What sets apple devices apart is the quality and quantity of apps and the cool/wow factor many of these bring to the platform. To add to this, we have the existence of a large customer base who are already tied into this ecosystem via the iphone.